Dawlish line 'like theme park ride' Jump to media player The railway line at Dawlish in Devon is left hanging in mid-air after storms ripped away supporting ballast. 'Water coming through our windows' Jump to media player Dawlish resident Chris Saich tells the BBC that he was evacuated from his home on Tuesday night after the coastal town was hit by a powerful storm. 'Flood danger is imminent, evacuate' Jump to media player People in Moorlands in Somerset were told to evacuate by announcements from the police helicopter as flood water neared their homes. Storm-hit boats winched from harbour Jump to media player A major salvage operation is under way in Porthleven to winch all of the boats out of the harbour. UK storms destroy key railway line Jump to media player Thousands of homes are without power and a section of railway destroyed after strong winds and rain hit parts of Britain. Warning over sand dune 'cliffs' Jump to media player Beach walkers have been warned to avoid sand dune "cliffs" created by recent storms on the Carmarthenshire coast due to the risk of collapse. Waves crash over sea wall at Chiswell Jump to media player James Grant filmed this footage of waves crashing over the sea wall overlooking Chesil Cove in Dorset. Storm was 'like an earthquake' Jump to media player Robert Parker describes how a powerful storm hit his home in Dawlish, Devon. Sandbags stacked as homes flood Jump to media player Claire Marshall reports from Moorland, in Somerset, where the Environment Agency has said it is struggling to contain flood waters. Dawlish sea wall collapses in storm Jump to media player The police have declared a major incident in Dawlish after a section of the sea wall under the railway line collapsed. Wet and windy weather to continue Jump to media player BBC weather presenter Matt Taylor explains what the UK weather has in store for the month of February. Waves crash over the harbour in Looe Jump to media player Looe in south east Cornwall floods again because of a combination of high tide, severe gales and huge swell. 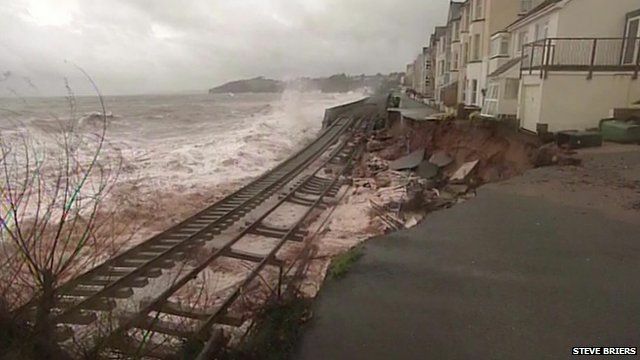 The railway line at Dawlish in Devon has been left hanging in mid-air after severe storms ripped away supporting ballast. Repairs to the track, which links Devon and Cornwall to the rest of the country, have been halted because of safety concerns.